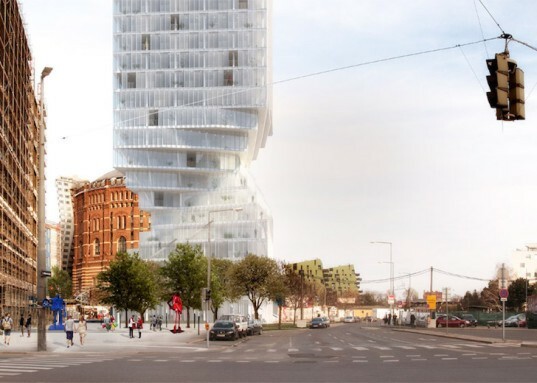 Rotterdam architecture firm MVRDV scooped the winning bid in a design competition for a modern, mixed-use skyscraper in Vienna. The proposed 361-foot-tall tower is sheathed in a glass curtain wall that opens the building up to views of the city center. The most eye-catching feature, however, is the building’s twisted base, which gives the mass a distinctive hourglass shape and reduces the amount of shadow it casts over neighboring blocks. 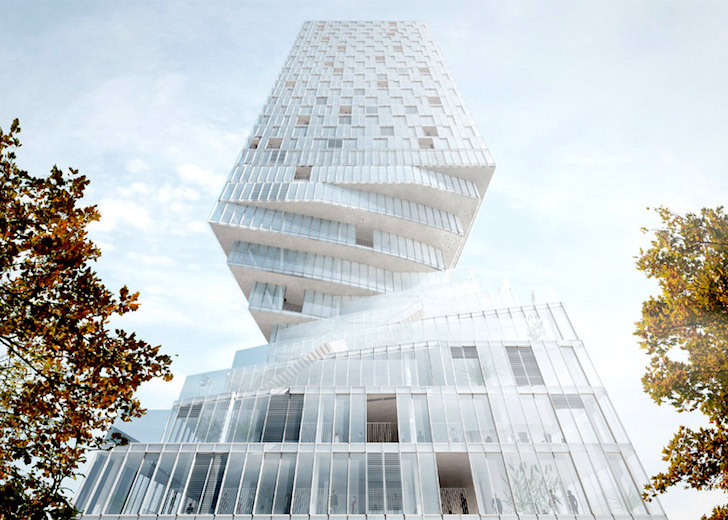 Characteristic of MVRDV’s playful designs that deviate from the norm, the tower features an interesting, contorted shape. In addition to establishing the building as a regional landmark, the peculiar form will lessen the amount of time the surrounding buildings are kept in shadow and help visually connect the skyscraper with the plaza below. The architects plan to turn the staggered terraces created at the twisted base into accessible outdoor space and wind barriers. The mixed-use tower is located near Vienna’s historic Gasometers and will comprise retail, restaurant, and 377,000-square-feet of either housing or office space. The interior will feature 11.5-foot-tall ceiling heights and 80 percent of the space will be kept column free. The surrounding plaza will be designed like a gigantic sundial, with the building serving as the time-telling style. In addition to establishing the building as a regional landmark, the peculiar form will lessen the amount of time the surrounding buildings are kept in shadow and help visually connect the skyscraper with the plaza below. The architects plan to turn the staggered terraces created at the twisted base into accessible outdoor space and wind barriers. The mixed-use tower is located near Vienna’s historic Gasometers and will comprise retail, restaurant, and 377,000-square-feet of either housing or office space. The interior will feature 11.5-foot-tall ceiling heights and 80 percent of the space will be kept column free. The surrounding plaza will be designed like a gigantic sundial, with the building serving as the time-telling style. The proposed 361-foot-tall tower is sheathed in a glass curtain wall. Natural light pours through floor-to-ceiling glass.